When we’re designing an event – we look for a single design element that catapults the overall look. It’s one inspiration source that we can then layer other details to create a cohesive design. That inspiration could be a color, a smell, texture, a sound, or lighting. An event should tell both story and exude a feeling. For events we design and produce, we ask our clients several discovery questions that allow us to hone in on their objectives and the experience they want their guests to have. For an event we recently designed and produced for App Annie, the most trusted app data and insights provider, the focus of the event was the “future,” the Future of Apps specifically. We were thrilled with BizBash shared our event in their recent Event Report. 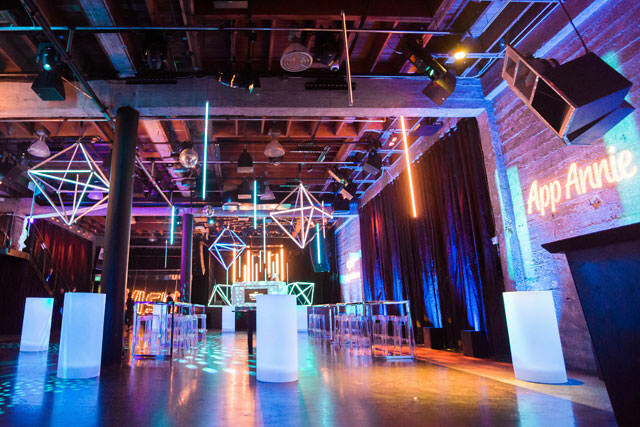 The audience was game developers and the venue was a live music, warehouse feel venue – Mezzanine. The venue had lofty ceilings, exposed brick and a moody feeling. The venue wasn’t futuristic at all, but we were going to create that. The bones to accomplish this were there, we just needed to get creative. Walking into the space confirmed the main design element was going to be lighting and we would accentuate the ceiling with a stunning lighting installation. We partnered with Got Light, a lighting company in San Francisco to help us design the lighting treatment. Got Light has a light fixture called a trondelier and as soon as I saw it, I knew that was it and the design centered around these fixtures. From there – all the furniture we brought in from Blueprint Studios was illuminated. Entertainment was important to this group. The Dueling DJ’s, highlighted with the animated event logo on their DJ booth, and hypnotizing LED tube backdrop amped up the crowd. They were fascinated by the LED hula hoop girls and mesmerized by the glow-in-the-dark aerialists. A gamer paradise wouldn’t be complete without a foosball table. However we couldn’t just get any foosball table – we went for the 10ft long LED foosball table. To say it was a hit is an understatement. We continued to weave the theme throughout the event and that even included the food. We teamed up with our go-to San Francisco caterer – Culinary Eye to create a menu. Culinary Eye is know for their unique plays on food which is just one of the reasons we love collaborating with them. They also do the most amazing food installations. For this event we had Heavy Metal Sliders, Carbon Footprint Crostini’s and Protein Supplements. We also had a Vision Popcorn Wall with Orbs in the Abyss (aka donut holes) spilling from the O. Every event designer has their own style – that’s why they are designers. We take a single design element and layer in design details. We never want to be guilty of “over-designing” or “over-producing an event. Understated, subtle qualities are much more powerful than overwrought, boastful, in-your-face design elements. Our designs look effortless, but are impactful, memorable and relevant.